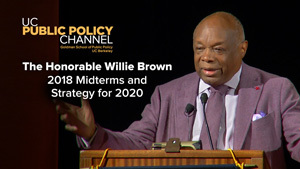 Willie Brown has spent his life in public service. He served over 30 years in the California State Assembly – 15 of those years as Speaker – before becoming the first African American mayor of San Francisco. For the past 10 years, he’s been writing a column for the San Francisco Chronicle on politics, movies, art, and anything else on his mind. When he took the podium at the Goldman School of Public Policy recently, he touched on lessons from all those experiences. But, his main focus was the 2018 midterms and the upcoming general election. Brown began by looking back to 2016, explaining why he predicted Donald Trump would win the presidency. Brown, a lifelong Democrat and friend of Hillary Clinton, says Clinton could have been one of the best presidents in history. But, Brown knew that Trump had the skill and ability to connect with voters in a way Clinton could not. Brown also traces Clinton’s loss across several election cycles, when Democrats lost the House and the Senate during the Obama years. Trump’s victory however, could be the key to the Democratic Party’s recovery, Brown says. He says Trump has failed to build a coalition beyond his core supporters that voted him into office. That helped Democrats win in states like Michigan and Wisconsin in 2018, where Clinton lost in 2016. Brown also credits Nancy Pelosi with organizing the party to help take back the House. But, in order to keep that momentum going and defeat President Trump in 2020, Brown says Democrats have to identify a strong candidate with the same ability to move voters. He says there are three strong options from California, and one in particular he hopes to see on the ballot.